When a collector or a dealer finds themselves inheriting family antiques or vintage items--it is not necessarily the wonderful windfall it may first appear. I am a dealer and I am WAY too sentimental about stuff. If something catches my eye that I am buying to sell--it is not unheard of that it spends some time in our home. Because there is no personal connection to these items, it is not hard, after a time, for the goods to find their way into the shop. Not so easy and clear cut with personal inherited items. 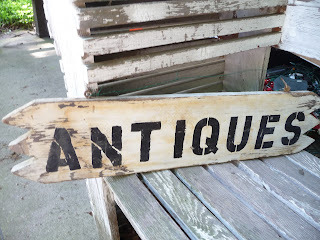 In the past couple of years--I have "come into" quite a few items belonging originally to my grandmother and great grandmother and before. What to do? Keep it all? Stuff it in our house? Fill closets or bins in the garage? Keep it or donate it? Sell it? Guilt abounds. But Grandma used that biscuit cutter!! Grandpa used the camera! Great Aunt Can't Spell Her Name hooked that rug! Hobnail glassware will come back in fashion! I don't know what that tool is, but Great Grandpa used it! Now the guilt. I am a person who will walk an extra block to the crosswalk to cross a street safely. I have NEVER been stopped by a police officer for a speeding ticket. I draw the drapes when I cut the Do Not Remove tags from mattresses. And I am supposed to GET RID of inherited stuff?? That Just Is Not Done! Yes--yes it must be done. 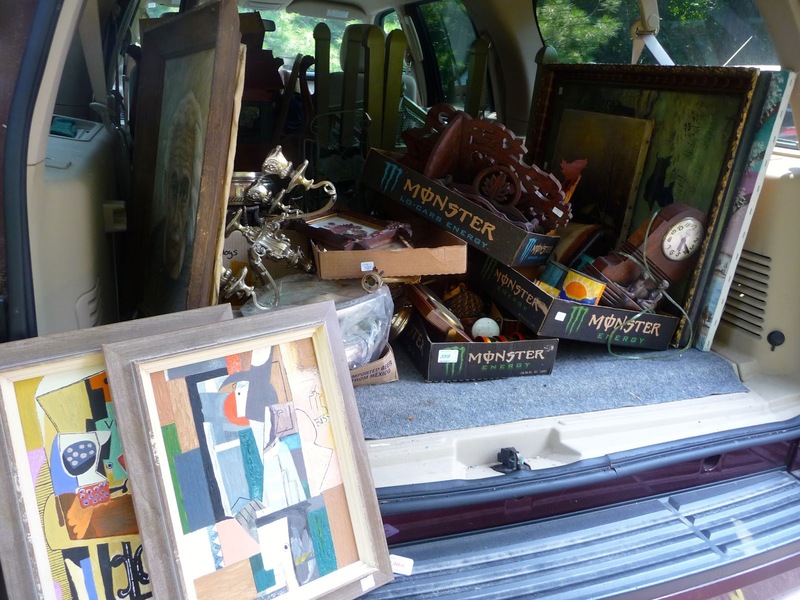 If you are a dealer or collector or just a plain old person--chances are your house and shop are filled with items that did not start with your family--but started in someone ELSE'S family. Things must move on. I do not make biscuits. I will not use the camera. I can use one but not eight hooked rugs. Hobnail glassware will NOT come back in style. For me--it has just meant prioritizing. I have culled through and kept special pieces for entertaining that I really have and will use. A few. Not 100. I have kept the bread and butter plates from Grandma's dishes--because I will use them for hors d'oeuvres at parties, not the whole set. I have kept a few tools with real patina or character--not the tool box full. The memories of all the stuff are still there--but there comes a time. Give yourself permission to keep what you love, and let the rest move on.